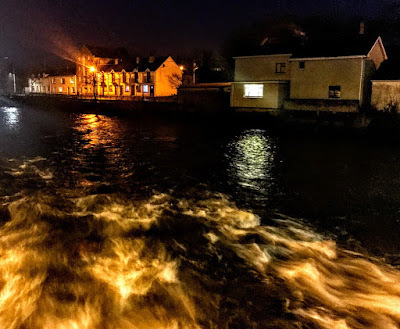 There are still signs along the Quay in Askeaton that this was once a thriving, trading port on the Shannon Estuary, shipping grain, corn, cattle and agricultural produce to and from Limerick. One clue of this past is provided by the derelict Victorian corn warehouse on the Quay. This five-storey, three-bay mid-19th century quayside warehouse is a gable-fronted building facing onto the Quay. This warehouse was built around 1847, situated overlooking the River Deel. There are loading doors in the middle of the façade on each floor. The warehouse was built of rubble limestone walls with a covering of harling and roughly dressed limestone quoins. The roof is pitch slated. The window shutters and doors are of sheeted timber. There are square-headed window openings with brick voussoirs and timber battened fittings. The square-headed loading bay in the centre bay has brick voussoirs and timber battened doors. 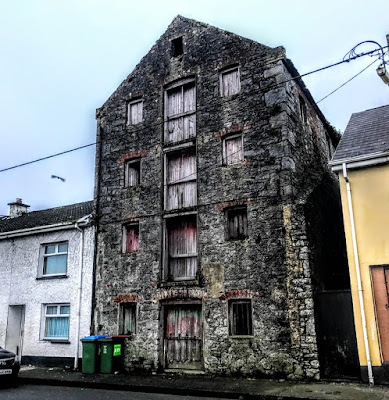 This warehouse forms part of an interesting wider group of mill-related buildings found around Askeaton. Its deep form is typical of buildings like this, with its gable-ended loading bay facing onto the Quay. Corn was directly hoisted from the boats on the River Deel into the warehouse. This warehouse retains its original structure, including external and internal timber fittings, brick dressings and slate roof. I think a sensitive and innovative developer could transform this building, with a quayside restaurant on the ground floor, offering dining with a riverside setting, and attractive apartments or office space in the floors above.